The firm of Georges Carette & Cie. was founded by Georges Carette in Nüremberg Germany in 1895. Georges Carette, was a native born Frenchman who moved to Germany as a young man when his mother, who was originally from Germany, returned there after she remarried. In 1886, when he first arrived in Germany, Georges opened a toy company in Nüremberg backed by his German foster father, Salomon Siegmund Hopf. Siegmund Hopf was a businessman and property owner in Nüremberg, and a cousin of the industrialist Ignaz Bing. The original company was co-founded with the Bing brothers Ignaz and Adolf, with the idea being that the company would work exclusively as a supplier and contractor for Bing producing pieces in a wide range of materials. The factory was located at Schillerstrasse 5 in 1892. In 1893, at the World Columbian Exposition in Chicago, Carette introduced a self-developed toy tram that caused a stir as it was powered by electricity. The original company that was an exclusive supplier to the toy manufacturer Bing was dissolved after about ten years (on March 25, 1895), with Ignaz and Adolf pulling out. A new independent company was formed with just Georges in control. Since the original company wasn't really an independent manufacturer, and was only established as a fabrication house for Gebrüder Bing, it tends to be ignored. 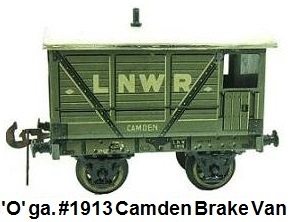 The new firm did well and made toys of all different types, including model boats, cars, steam engines and railways. All models were mechanical and made of tin. Many were lithographed and favorites were electric streetcars and model trains. 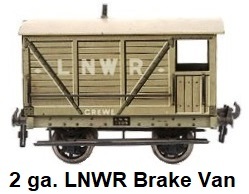 The firm's train production was in tinplate and brass and ranged from gauges 3 and 2 alcohol-fuelled "storkleg" locomotives through to carriages (passenger cars) in gauges 1 and 'O', with locomotives variously powered by steam, electricity and clockwork. It competed with the likes of Bing, Märklin, and other large toymakers of the time. 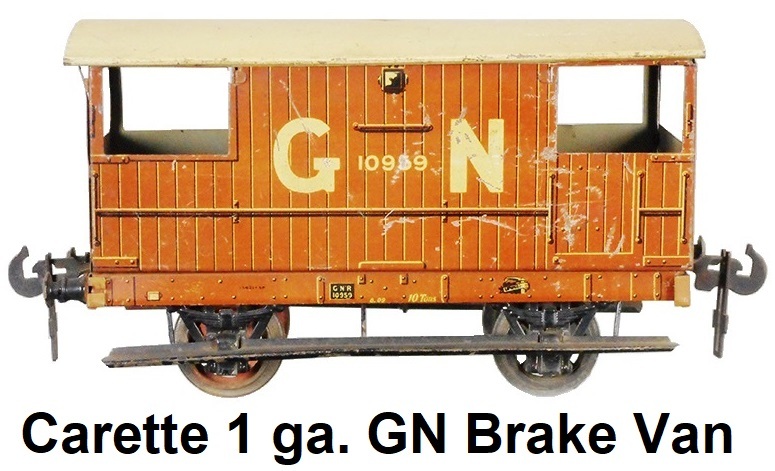 A partnership with Issmayer and Karl Bub of Nüremberg allowed all three companies to produce similar looking trains which often had only the logo that was different. Issmayer made parts for Carette and Bub and Doll among others to resell including clockwork mechanisms. Before 1900 the company concentrated it's production to a range of tin and brass toys, some of which were made by Hess. 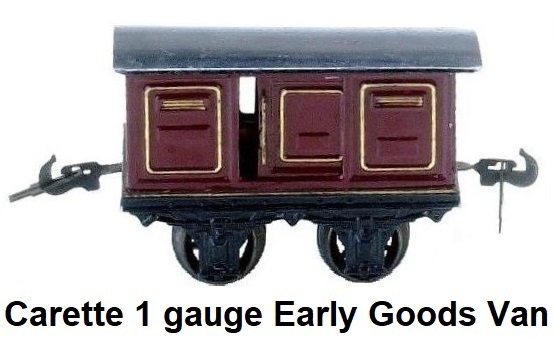 Trains were either steam powered or clockwork driven up until 1898, when the first electric locos were made. 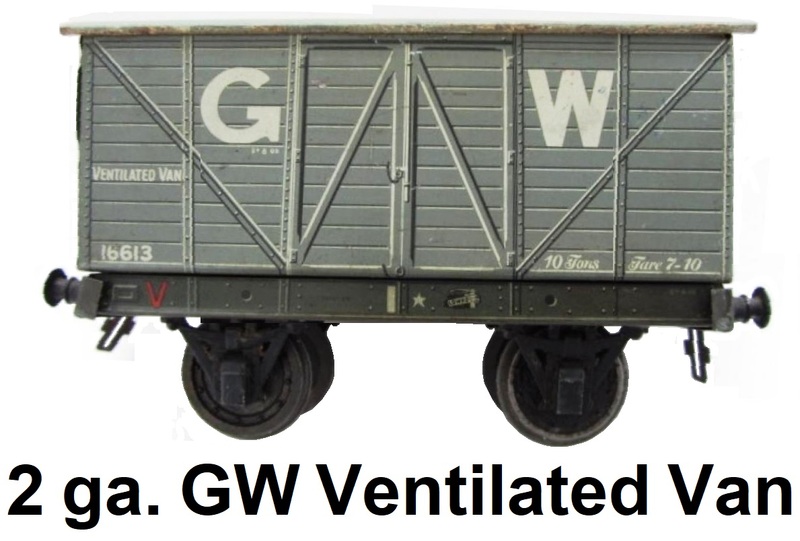 The first live steam driven trains were packaged in sets, usually with a locomotive, tender, coal ore wagon, baggage van and passenger coach. The early locomotives from the 1880's were alcohol fired 0-4-0 brass wheel arrangement, had a single piston drive and a whistle. 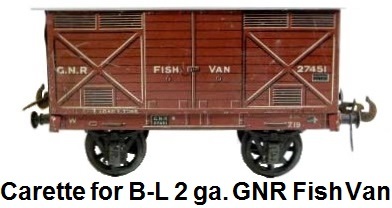 The boiler was brass and the cab was tinplate. The sets came in a wood box adorned with a colorful polychrome lithographed paper label depicting a passenger train travelling over a viaduct through a mountainous landscape. The wheels on the cars were made of steel. The 12 pieces of curved track supplied were made of solid sheet metal pieces with embossed sides that formed high curbs. 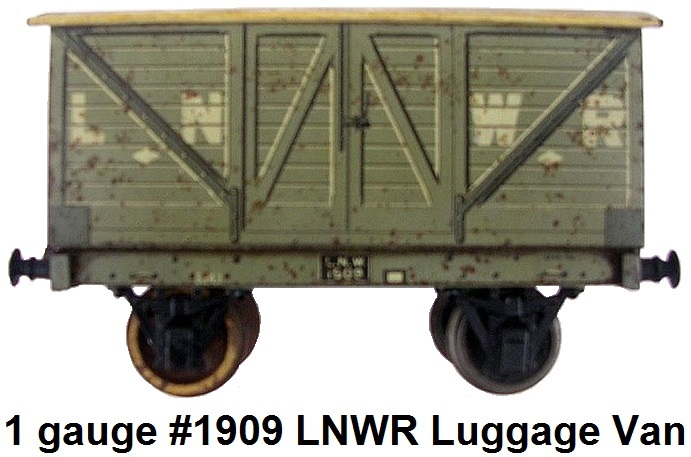 The curbs formed by the rolled up embossed track sides kept the trains inside the tracks. Also included were a small assortment of extras such as four sections of cotton wick, a tiny tin cup and funnel and a small brass wrench. 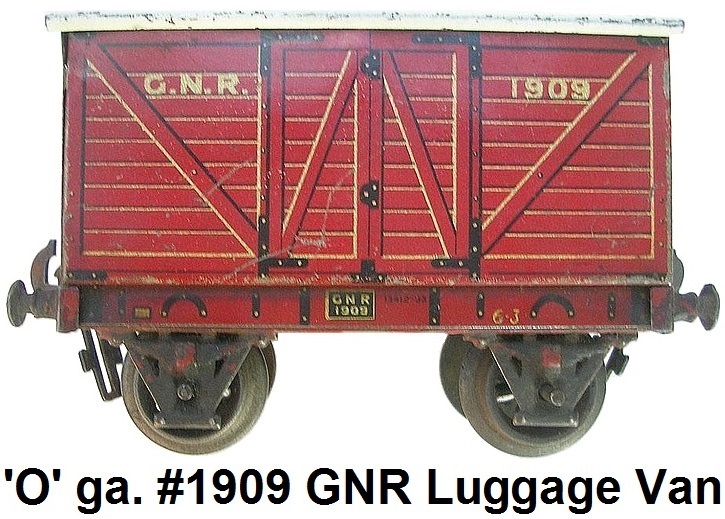 By 1890 tubular tin track was substituted in these sets. Couplings between cars were facilitated with hook and loop type mechanisms. 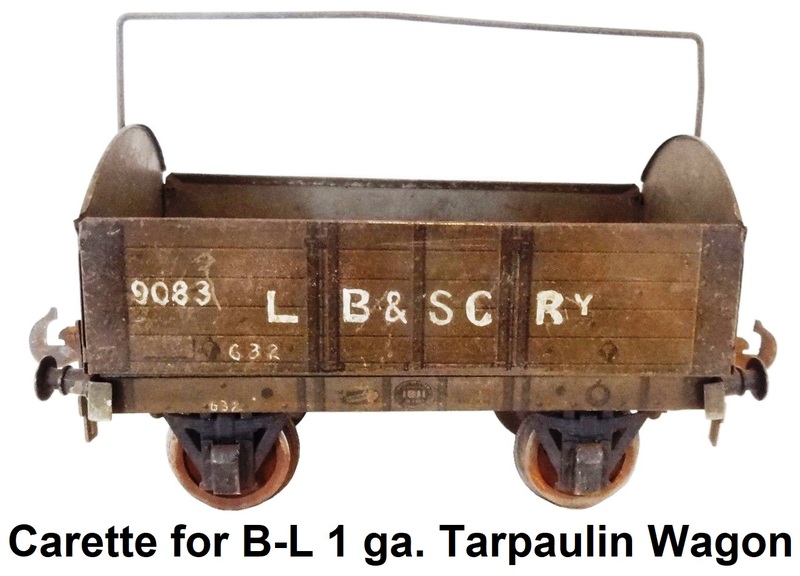 Eventually, Carette trains were outfitted with link and pin type couplers that were interchangeable with Märklin couplers. This allowed running of mixed trains with rolling stock from both manufacturers. Carette made beautiful locomotives combining embossing and lithography. Carette specialized in the application of Chromolithograph when printing on sheet metal. By September of 1899 Carette & Cie. occupied four large blocks of buildings at Schillerstrasse 5 containing 1000's of square yards of floor space outfitted with steam power and labor saving devices for carrying out their extensive business of manufacturing steam driven, hot air powered, and electrical working model engines. This location also housed a 200 foot long showroom that contained displays of the Carette steam and clockwork trains, accessories such as crossings, turntables, station buildings, signal boxes, weighing machines, telegraphs, lamps, trucks, porters, and the varied furnishings of a busy railway station. Locomotives, vertical and horizontal steam engines, engine parts comprising wheels, cranks, cylinders, and gauges were also on display. As well, steam and clockwork powered boats from the very plain and simple to the more elaborate models of modern warships were shown. The room also contained toy cinematographs, magic lanterns with slides, stereoscopes, telescopes, optical and scientific toys and small versions of workshop appliances such as drills, lathes, steam hammers, presses and shafting sets. Rapid growth in business called for even further expansion, and another factory was built on the outskirts of Nüremberg which was dedicated entirely to the lens grinding process. The company principals were now Messrs. Georges Carette and Paul Josephthal. Georges was the senior partner, while Mr. Josephthal handled the day to day operations. Leonhard Longis, a local Nüremberg businessman, became company manager and handled all legal matters. By this time, Carette was selling products over the entirety of Europe, into Austria and Russia. All of the important towns in Great Britain and Ireland had dedicated sales representatives. After the turn of the century the company expanded even further, despite a fire in the factory in 1903 that caused a setback. The storage buildings of the factory were completely destroyed by the fire along with the raw materials and supplies. The engine House and the actual factory building were saved and restored. On July 31, 1900 Georges Carette & Co in Nüremberg was awarded a German patent for a wheel flange for toy vehicles (Spurkranzrad für Spielfahrzeuge, Spielzeug). 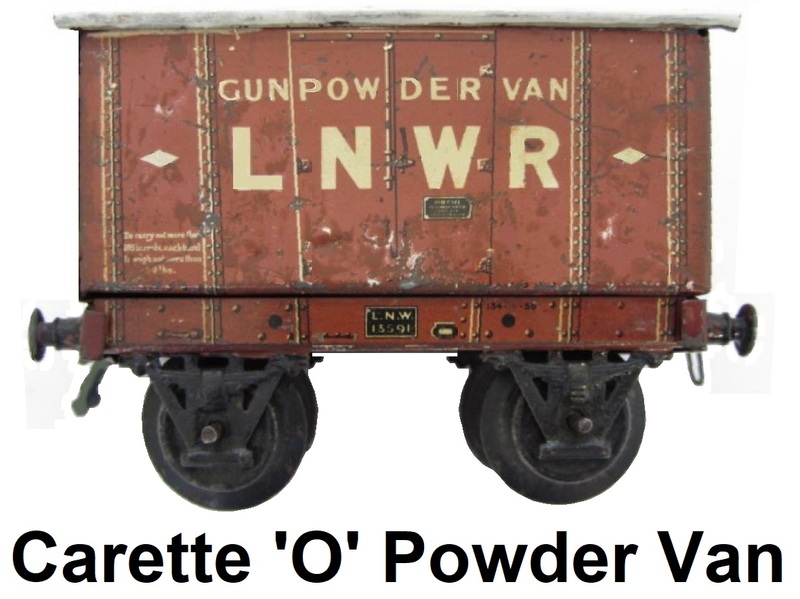 On July 28, 1900 Carette received a British patent for an improved gear slide for model locomotives. 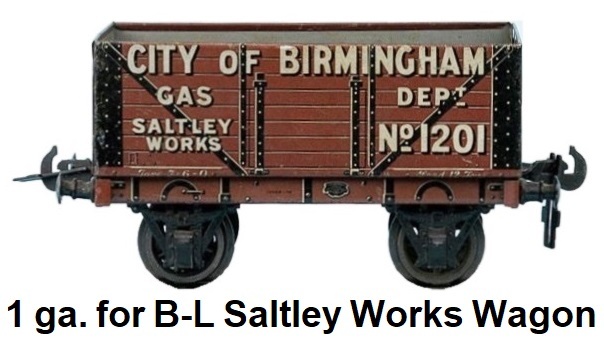 Lithographed tinplate model locomotives were followed by more substantial steam-powered models, and via an introduction by Paul Josephtal, Georges struck up a working relationship with Bassett-Lowke to supply models designed for the British market. Carette then made a good deal of carriages for the English market. They were very elegant and the reality was artistically interpreted. 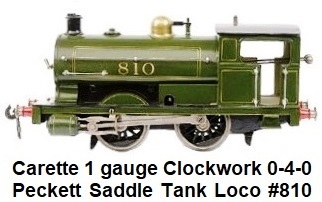 Around 1904 George Carette created a gauge 1 model locomotive for Bassett-Lowke called The Lady of the Lake. It was a simple, beautiful and a reliable example of workmanship from Germany. It was a Ramsbottom 2-2-2 configuration with oscillating cylinders and an externally fired boiler. This is commonly considered to be the first ever commercial semi-scale model mass-produced in the form of an actual prototype. Later came gauge II and III equivalents, the Claud Hamilton and the Smith Compound, and a squat gauge III Stirling single. Up until this time, toy trains were very retrospective and whimsical in design. By 1900 there was a shift in taste for realism over fantasy. 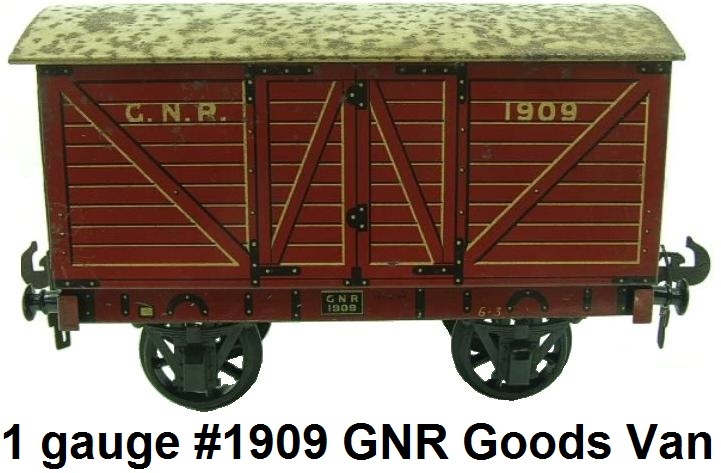 George Carette's gauge III #1619 Smith Compound North Eastern Railway 4-4-0 is believed to have followed the original builder's blueprints of the prototype. The model was constructed entirely of iron castings and thus had a difficult time moving much other than itself. 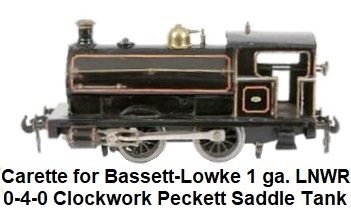 Nevertheless, it was a handsome locomotive and the first German made gauge III piece to be offered by Bassett-Lowke. 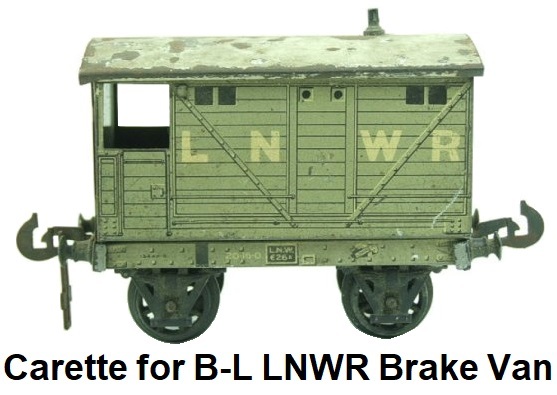 Carette produced the largest of the commercial model coaches in gauge III (2½" gauge) for Bassett-Lowke in the form of an NER (North Eastern Railway) 1st and 3rd class coach and a luggage brake van. Both were finely lithographed. In June of 1902, Georges Carette & Co in Nüremberg was awarded a German patent for a mechanism that reversed directions for toy steam engines (Kulissen-Umsteuerung für Spielzeug-Dampfmaschinen). Carette saw its most innovative period between 1905-1914. Besides the toy and model trains, production items included clockwork toy cars and ship models, aircraft, airships and optical and technical toys such as electrical and electronic construction sets, chemistry sets, and complete miniature powered factories. There was even a working model brewery and an X-ray set. All toys made by Carette were well known and appreciated for their quality. By 1911 the Carette factory had about 450 employees. The 1912 Carette catalogue listed 200 pages of items. 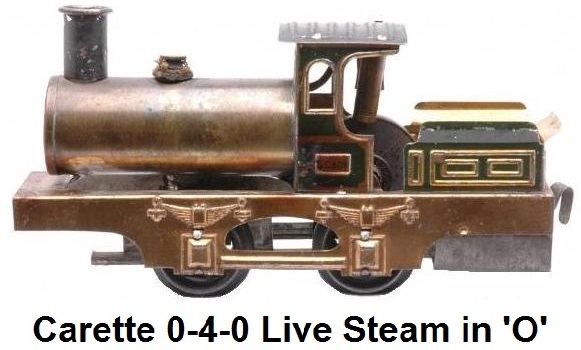 In the early 1900's, in an attempt to cater to the American toy market, Carette came out with the #2350 1 gauge 4-4-0 Compound Locomotive in both clockwork and live steam versions. 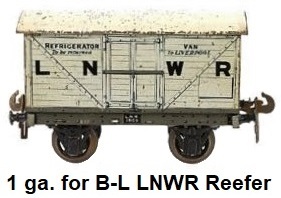 It was fitted with a cowcatcher for the United States consumers. The moniker of compound locomotive comes from its design where there was a pair of piston rods on each side of the engine. The double-cylinder design was a form of compounding that was first employed on prototype steam locomotives in the United States around 1900. The high-pressure cylinder was superimposed on the low-pressure cylinder on each side of the machine. Each pair of piston rods drove a common crosshead and connecting rod, thus avoiding a crank axle, which was the alternative for driving a four-cylinder machine. The efficiency of this configuration was not to be surpassed for many years. Ironically, only the clockwork version of Carette's model employed the dual cylinder design. 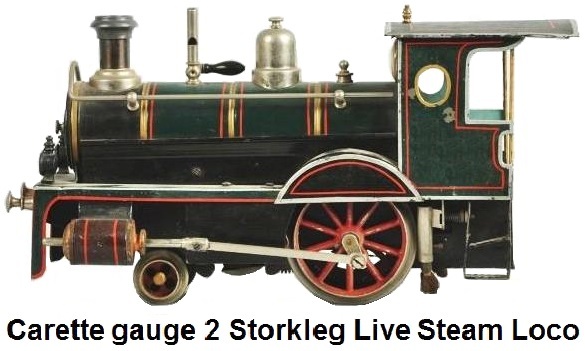 The live steam version had a single functioning cylinder on each side of the locomotive. The Carette model was highly detailed, and the clockwork mechanism was robust with both forward and reverse gearing. The tender featured three opening tool compartments and an opening water reservoir. It measured 23 inches in length. 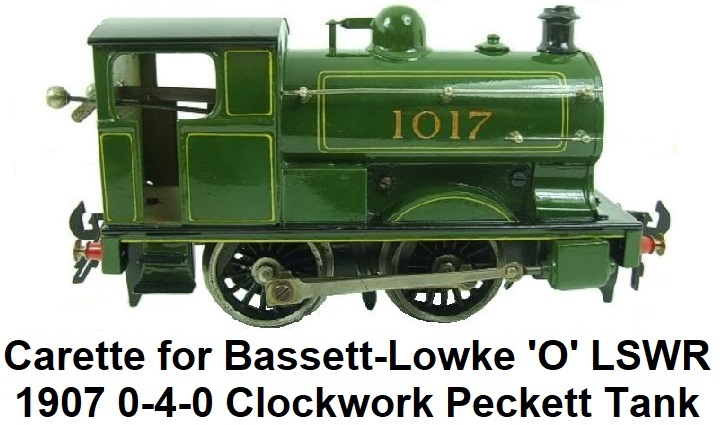 In 1910, the Caledonian Railway gave an order for 30,000 clockwork 'O' gauge models in ¼" scale to Basset-Lowke. 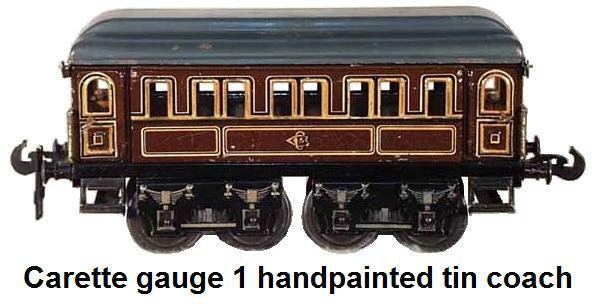 This became a sub-contract with Georges Carette to produce the well-finished lithographed tinplate models of a Caledonian Railway locomotive and West Coast carriage. 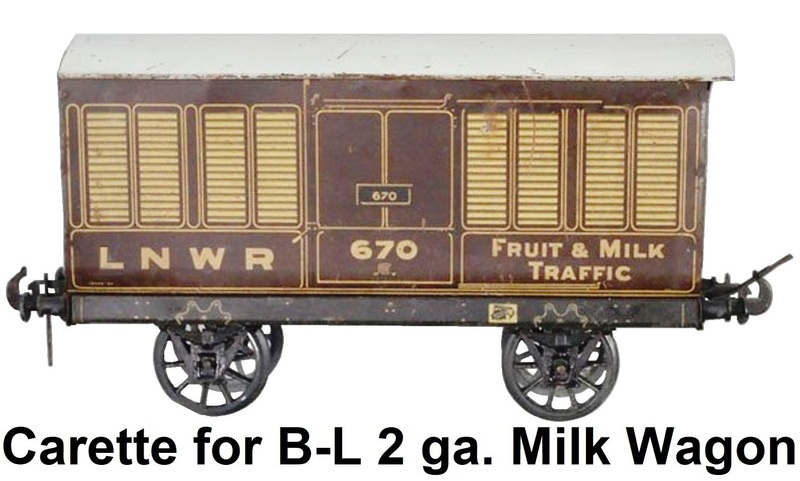 These model trains were sold as a marketing exercise in conjunction with the Caledonian Railway at bargain prices through stands at railway stations. 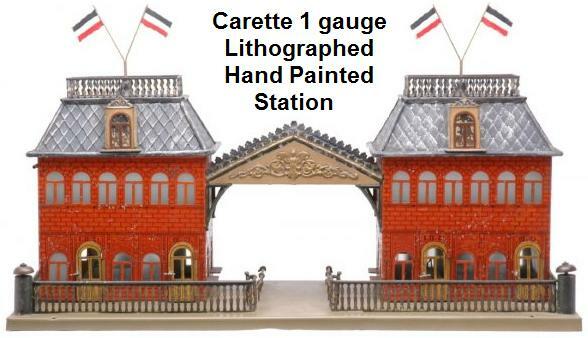 The Carette factory was justifiably proud of the range of printing processes that they had mastered for applying to tinplate, and Carette's "printed tin" pieces are often notable for their bright colours and the amount of sharp detail. 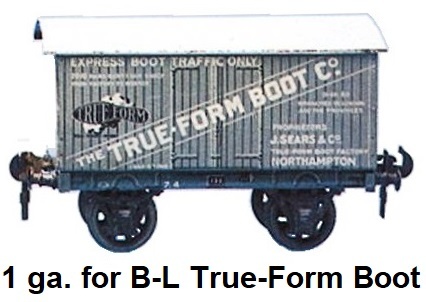 Sometimes this was sophisticated and restrained (such as on the rich blue Cardean loco), and sometimes, when a more toyish look was required, it could be used to produce a cartoonish level of overdetailing that made one forget that the physical shape of the toy was actually quite simple. By 1911, the Carette factory had about 450 employees. In addition to the Nüremberg factory showroom, Carette & Cie. now had showrooms in London at 8 Fitsbury Square, in Berlin at Ritterstrasse 93, in Hamburg at Hopfenmarkt 1, in Paris at 64 Rue de Turenne, and in Vienna at Mariahilferstrasse 19/21. 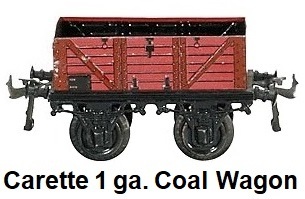 Carette produced lithographed tinplate electric trolley sets in both 1 gauge and 'O' gauge in the early 20th century when electricity was a relatively new concept in the world. 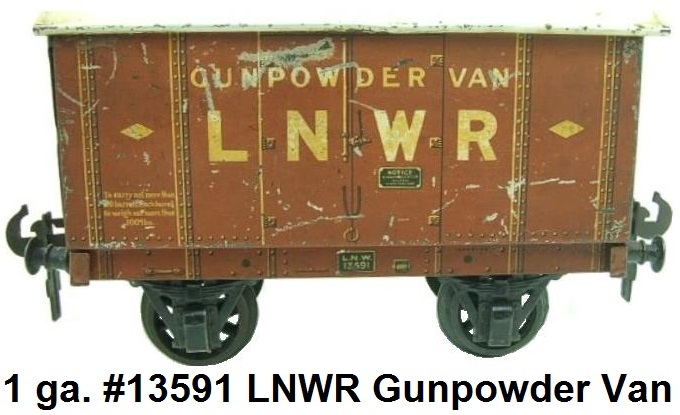 These sets came with a power car and trailer car, tinplate 2-rail curved track pieces and cast metal catenary poles that facilitated running the trolleys via overhead lines. The power car had a pole on the roof for collecting electricity from the overhead lines. 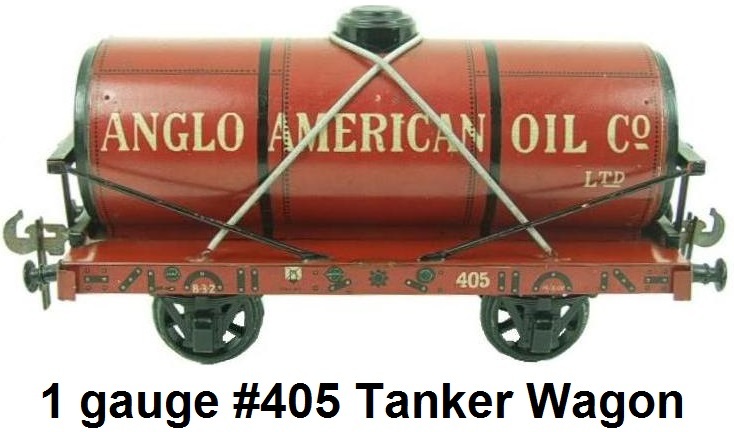 The 'O' gauge version was #35, as in its 35mm track scale and the 1 gauge version was #48, to signify 48mm track scale. The trolley cars were very colorfully lithographed and featured roofs that were hinged for opening, and there was celluloid placed in the window openings. 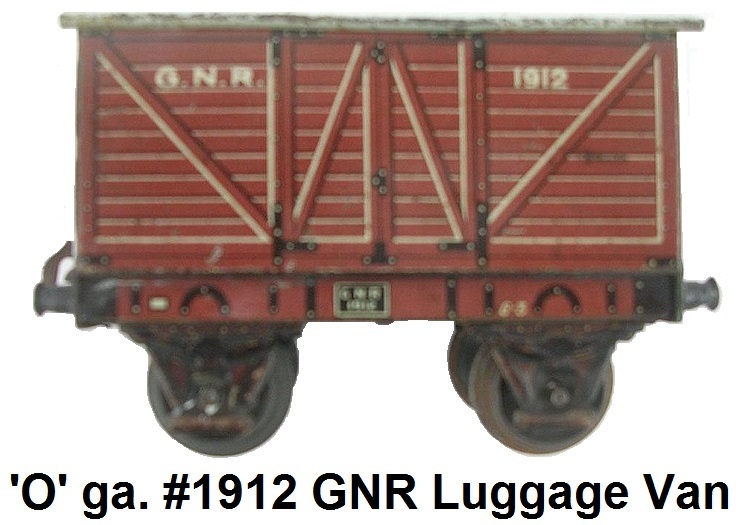 The 1 gauge cars were 8" long, while the 'O' gauge trolleys were 6½" long. 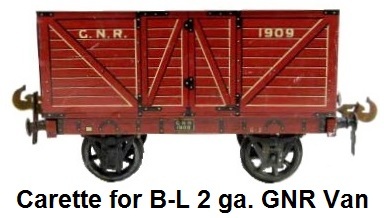 The 1 gauge version featured an operating headlight. 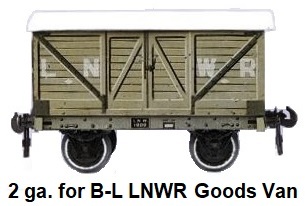 Later versions of these trolleys were offered for operation off of 3-rail track power or batteries without the roof poles. 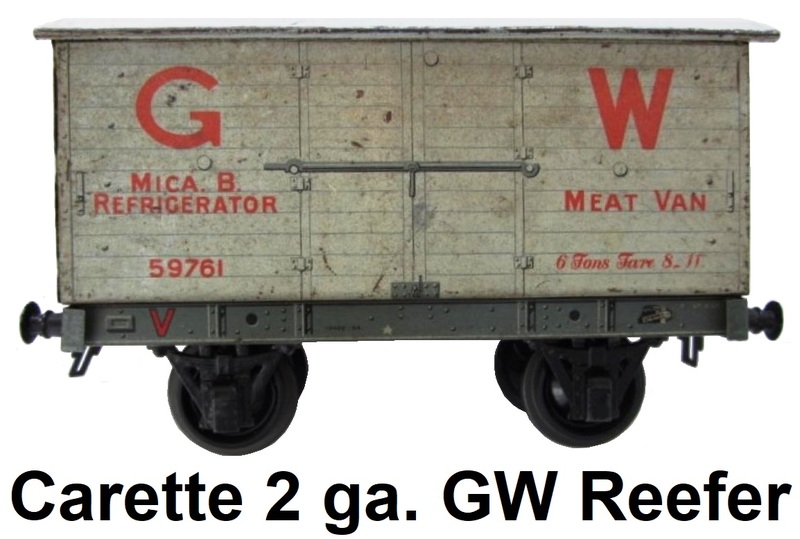 Georges Carette had obtained several patents for the technologies used in the trolley sets. Georges Carette was then, and would always be, a French citizen. Because of his politics and status as a French national, Georges fell afoul of the German authorities upon the outbreak of World War I. Even though he had married a German citizen, as a foreigner living in Germany and owning a factory, his assets were liable to be seized, and the factory was put into administration in 1914, with manager Friedrich Pergher put in charge. Georges along with his wife Margaret Pauline and two sons found it advisable to leave Germany. They fled through Switzerland, back to France, where Carette spent the rest of his life living north of Paris in Chantilly. His daughter Kunigunde Carette stayed in Nüremberg. Paul Joseph Valley continued to run the company for a time. Further wartime legislation resulted in an order in 1916 for the company to be liquidated. Liquidators were a merchant named Georg Soldan and a Bank Manager named Frederick Pacheco. All production ceased in 1917. By 1918, the company's status was still "in liquidation". Liquidation of company assets continued through 1921 with George Samuel of Fürth taking over. 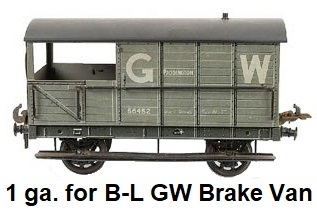 With the selling-off of the company's assets, the tooling and designs for the British-style locos and carriages was bought by Bassett-Lowke, who then continued selling essentially the same Carette range that they'd previously been importing, but making them themselves using the Carette tooling, in Britain. The "Continental" model railway-related assets were acquired by Karl Bub. The Nüremberg production facilities were taken over by Bauer GmbH, a subsidiary of competing manufacturer Bing. Bing, Carette, and Bub accessories have many identical counterparts in each other's catalogs. 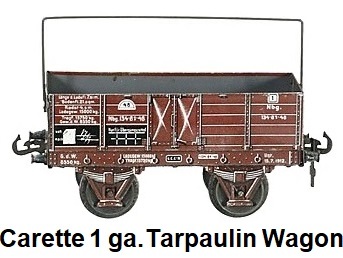 It is believed that since Georges Carette had previous relationships with both Stephan Bing and Karl Bub, that some of the tooling and dies for Carette trains may have ended up with both Bing or Bub after Carette was forced to leave Germany and closed shop. And Bub acquired Bing tooling when that company later ceased operations. 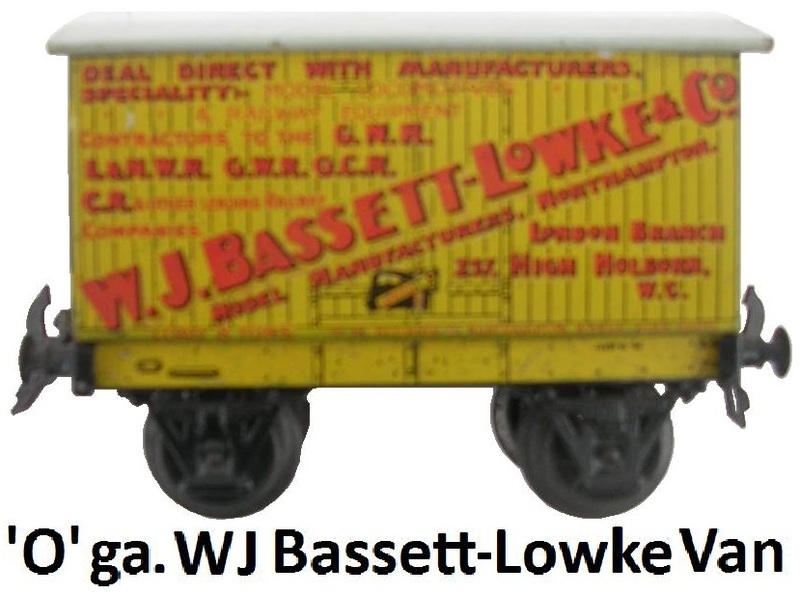 Bassett-Lowke continued to produce former Carette designed locomotives for many years. The liquidation of Georges Carette & Cie. was completed on October 21, 1936, and the company no longer existed. 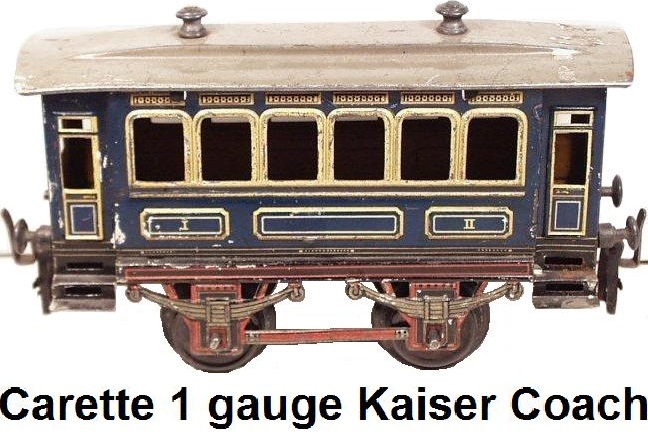 Carette, like these other toymakers of the time, produced a wide variety of railway equipment in several different gauges. 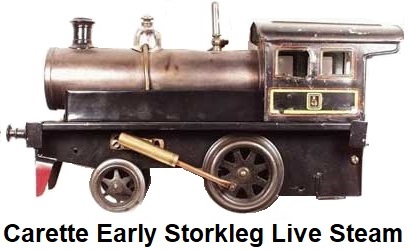 The 'storkleg' locomotive, introduced in gauge 1 by Carette in 1906, was typical of its time and similar ones were made by a variety of competing German companies. 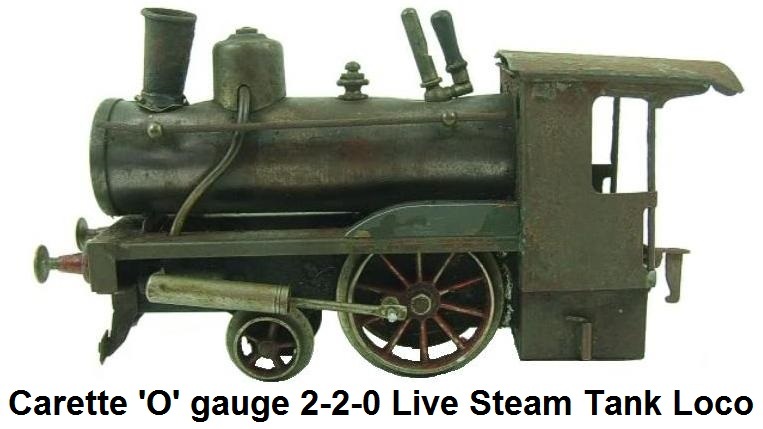 These 2-2-0 live steam locomotives were given this appellation because of the very long drive rods powering a single large wheel on each side. When in motion, this gave them the ungainly look of a stork walking. Storkleg engines were commonly available in gauges 'O' and 1. Carette, and perhaps others, even made them in gauges 2 and 3. Storklegs could have either oscillating or fixed cylinders. The engine had the usual low-pressure pot boiler. Boiler fittings included a safety valve and a whistle. The boiler was fired by an alcohol burner with three flat wicks. A large fuel tank was clipped in place beneath the cab. Two, single-acting oscillating cylinders powered the engine. These were reversed by a rotary valve between them, controlled from the cab by a long rod on the right side of the boiler that actuates a rocker arm that takes the motion inside, between the frames to the valve. The tinplate tender had no practical function and was just there for looks. It had a formed-metal coal load. There was an apron on the engine that folded down to cover the gap between the loco and tender when they were coupled. Storkleg-engines were made in the thousands. Many were destroyed by young hands, but a few have survived. Of those, most languish in private collections, spending their time sitting silently on shelves. 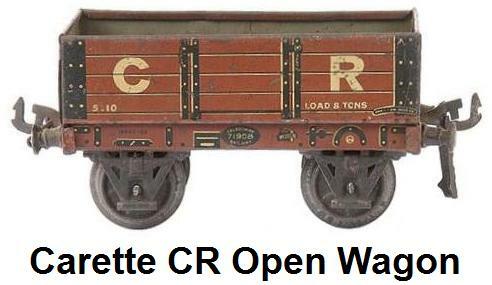 Carette trains are very hard to find and are highly valued by collectors today. G.C.N. 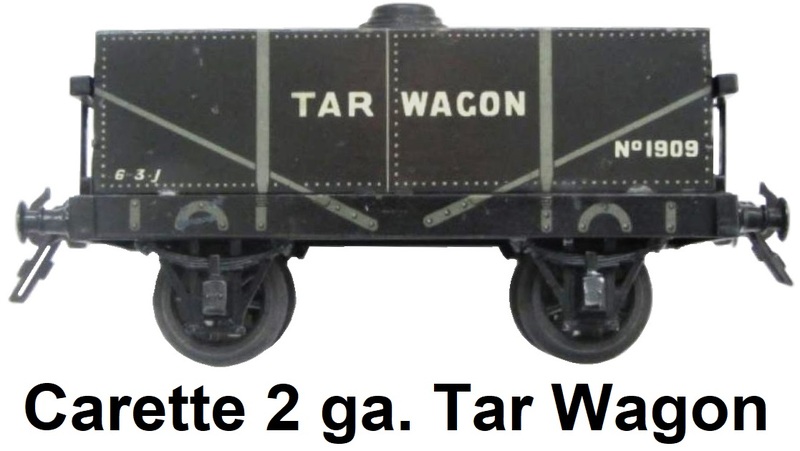 is the marking most commonly found on Carette trains. The Carette trains were highly detailed. 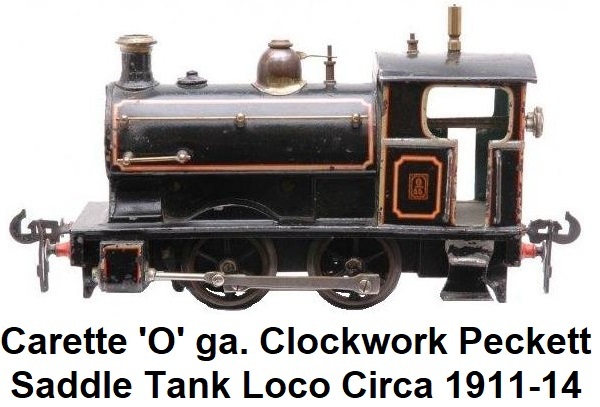 Locomotives came in both clockwork and live-steam driven models. Coaches came with fitted interiors and hinged roofs for access and viewing. 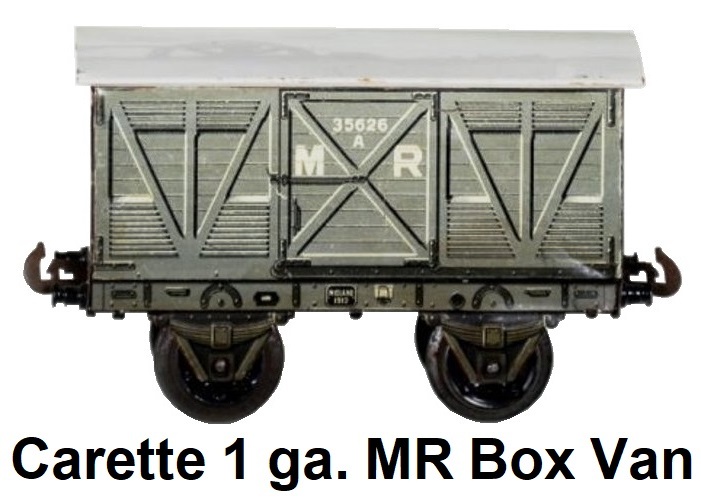 In June of 2007 a Carette gauge I #2350 locomotive sold for $35,750 in an auction in the United States. 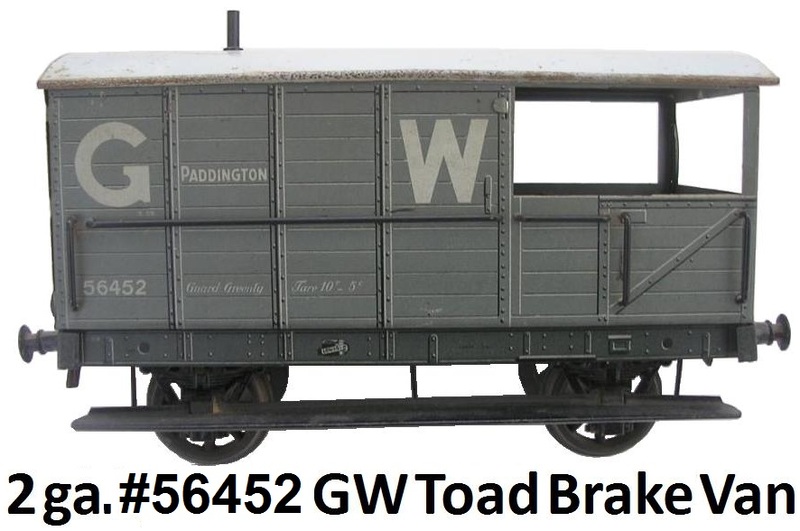 At a September 15, 2017 auction held by Pook & Pook, Inc. with Noel Barrett Antiques & Auctions LTD., a Carette #2350 clockwork passenger train set sold for $15,860. Georges Carette was born in 1861 and grew up in Middle Franconia. He was the son of a french mechanic named Théophile Charles Carette and his wife from Germany, Babette (née Edwards). Georges married Margaret Pauline Lederer of Nüremberg on March 9, 1888. Carette passed away at the age of 93 on January 8, 1954 near Paris, France. Link to website displaying multiple pictures of Carette model boats and ships made in the late 19th and early 20th centuries.